Doing your own Paradise Valley flooring restoration can be time-consuming and exhausting. To do a proper restoration, proper knowledge and equipment are needed. Desert Tile and Grout is always ready and prepared to help you in all your restoration needs. We work with all kinds of flooring tiles, including marble, flagstone, brick, Mexican, saltillo, and more. Desert Tile and Grout guarantees to do a thorough cleaning in every tile, making them more durable, lasting for decades with proper maintenance, and preventing discoloration over the years. We guarantee the best restoration service in Paradise Valley at the most affordable prices. Don’t hesitate to contact us for more information about our services. Thanks to our promise of providing top quality restoration to every tile we have worked on, we currently have 5-star reviews on Google and Yelp, with an A+ in Better Business Bureau. Our clients return to us not only for our services but because we treat them like friends. We deliver our flooring restoration services to both residential and commercial areas. Does not matter what type of flooring tile you have, we guarantee that we can work on it. Desert Tile and Grout is the best option for flooring restoration services inside Paradise Valley area and its surroundings. Paradise Valley is aptly named. It is an extremely small, upscale community surrounded by the McDowell Mountains to the east, Camelback Mountain to the South, and the Phoenix Mountain Preserve to the West, giving this town an unprecedented vista of mountains and desert. Although the population of the town is barely 13,000 the area is so beautiful that it holds over a dozen vacation resorts. Tile and stone are widely used in the beautiful homes and resorts of Paradise Valley. Each tile, whether majestic marble, decorative ceramic tile or rustic Saltillo tile requires special care. Desert Tile and Grout Care in Arizona has over 15 years of experience cleaning, maintaining, repairing, restoring, and renewing every type of tile. For example, Saltillo tiles are often hand made in Mexico and have a rustic, porous texture.This can allow dirt and spills to leave stains behind. Our professional Saltillo cleaning in Paradise Valley can remove deeply embedded stains and discolorations. Once the Saltillo cleaning is completed we can seal it leaving it impervious to stains. Ceramic tiles wear better due to the glazed surface, but the grout is mostly a mixture of concrete which easily absorbs stains and spills, leaving your floor looking dirty. Our Paradise Valley ceramic tile and grout cleaning service will remove embedded dirt and then color seal the grout so as not to allow any spills or stains to sink in. 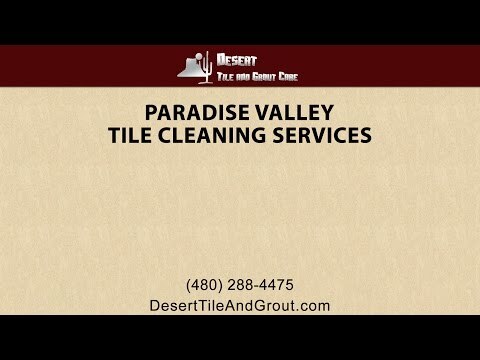 If you are in need of ceramic tile and grout cleaning, Saltillo cleaning, or if you need professional restoration or cleaning services done for your tile, stone, marble, slate, or brick floors, patios, or walkways, call Desert Tile and Grout Care today for affordable, professional tile cleaning. Desert Tile and Grout will restore your ceramic tiles and grout, making them have a longer natural lifespan and preventing them from losing their color. Tiles made out of Stone tend to lose their color over time. Even so, we can restore it back to life, including the grout between your tiles. Brick floor tiles need regular maintenance to stay clean all the time. If the grout starts to change color, we will restore it for you. This handcrafted tile made out of clay comes in every form and shape. We provide cleaning and recoloring to make it match to your Decor.